Alpinums. That was the name given to flower beds suggesting an Alpine landscape in gardens. In the 1800s, the tourist fad for mountain flora almost killed those plants. But then Alpine gardens were created to protect species, educate the public and launch research. In the 1900s, Dominique Villars made an important contribution to the study of Alpine flora. His herbaria and observations are today conserved at the Grenoble Museum and remain a reference for specialists. The remarkable story of an atypical scientist. Starting out from the Alps, they left for Russia, Iran or the Americas. With large boxes of plants, bulbs, seeds and colourful drawings portraying stupendous flowers for rich, overseas customers. In the 1900s, mountain folk invented an original type of long-distance peddling. Edelweiss. 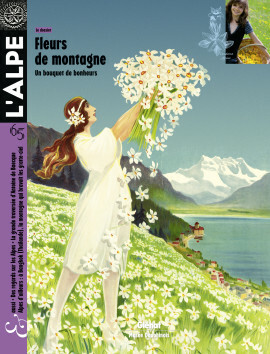 The emblematic flower of the Alps. Promoted as a symbol of purity and eternal love during the 1900s, it became the tourist souvenir par excellence. An Alpine star whose name from the Tyrol (« noble white flower ») is now common in every language. And its image may be found in just about any shape and form. … of Gentian flowers. Just like yellow, white and even red ! 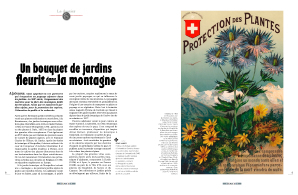 Federica Tamarozzi explains that Gentian flowers, a symbol of the Alps, are… feminist ! A closer look. « Flowers, I shall call you by your sobriquets », says Jean-Philippe Grillet, who knows something about Nature. As if the scientific Latin term or the popular name of a simple plant could have an effect on the desired intimacy. An approach to others that bears a resemblance with a meeting of lovers. Grasse, in the Alpes-Maritimes department, owes its reputation as the world perfume capital to the fusion of leather and flowers. A story that takes place at least partially in Grenoble with its glove industry. And which begins with the refined nose of an important nobleman from Italy. Walkers are delighted. Such grace in the diverse mountain flowers. But if they are not careful, entire ecosystems could disappear. If you must trample, leave the high-altitude meadows alone and visit the grassy pastures shaped over centuries by humans. A plea in defence of flowers. Cook and eat flowers ! That is the proposition put forward by François Couplan, an ethnobiologist, in his latest book titled « Edible wildflowers » (Éditions Glénat), presented briefly here. Changes in how the Alps have been seen are the topic of a fascinating book from which this illustrated excerpt is drawn. Innumerable travel logs, from the Renaissance through to the early 1900s, have portrayed landscapes and inhabitants, simultaneously firing imaginations. For Claude Reichler, this wonderful collection of engravings and lithographs represents a « geography of feeling ». In Bangkok, an artificial summit 80 metres high was constructed in the 1700s to honour a god. Elevation remains the ultimate symbol of spirituality and the Festival of the Golden Mountain reminds harried urban dwellers once a year that higher altitudes represent sacred values.